I've read about this method somewhere in the early 90's in a magazine. The idea was to cut the original hem off and reattach it again. 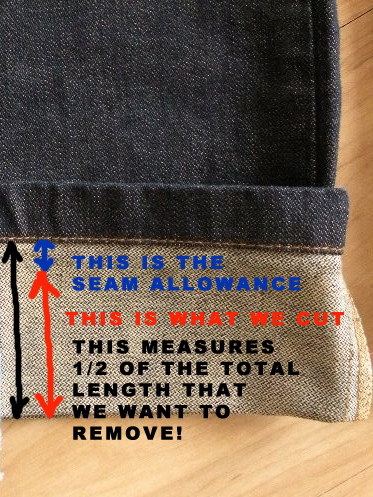 I must say, didn't used for myself that much but I've found it really handy to shorten my BF's jeans this way. Sometimes it's hard to find the right width/length combination or you buy a pair of pretty jeans on sale with the wrong length. But, some pants are made extra long for a purpose. Why? Nowadays, we aren't used to that anymore, so ready-to-wear jeans fabricants offer one waist size in several lengths. The idea is: you just pick up the right length an go. If it fits approximately it should be good enough. The good news: it's easy to fix! So why don't we just chop off the hem of a pair of jeans? - To sew a pair of jeans they use a thick thread, often in very special shades which you can't find on the market. There are probably similar colors but the thread would be too thin. And why would you bother to buy thread just to hem one pair of jeans anyway? - Another reason is, especially with faded or distressed jeans the hem is often part of the design. They assemble the jeans first before adding design elements of fading or distressing the fabric. If you look at the jeans below on the left, you see that this finish can't be reproduced at home. Below is what you definitely don't want to end up with!!! There is one thing left, you need to 'recycle' the original hem somehow. I used white thread for the demonstration, but for a really neat finish I'd choose dark blue or other color similar to the color of the jeans. 1. Measure and mark the desired length you want to remove. The original hem is going to be folded down at the end so it adds some extra length, but most of the time this is not that much. Repeat the same for the other hem.